What does your iPod do? 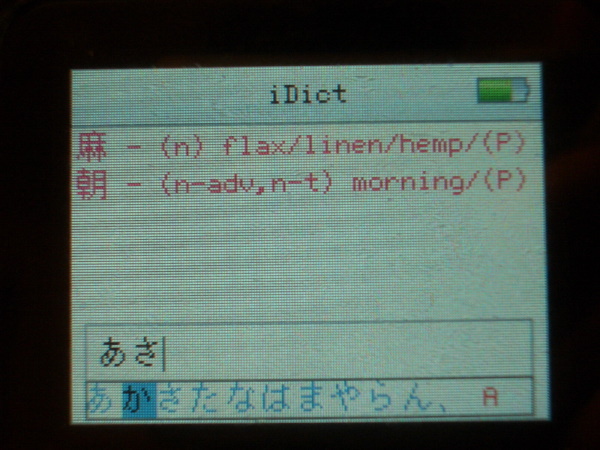 I just got a brand new handheld Japanese dictionary. It’s very complete, using one of the best database out there, smaller than a few credit cards stacked together and I paid 20,000 yens for it. Oh, it also plays mp3s. In fact, it does a whole lot of things, pretty much anything I want it to do, provided I have time to write a program for it. 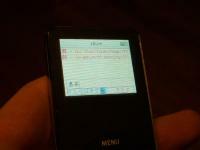 It’s an iPod Nano, running µClinux, thanks to the brilliant work of the iPod Linux team. If you remember, I was severely torn over the purchase of this little thingie. But then I look at it now, and think of the first computer I ever played with as a kid: this thing has more RAM, more storage, a better screen resolution and more CPU power. And you could fit it inside the floppy drive of the former… I’m getting dizzy, merely thinking of it. Anyway, I spent some time this week toying with my compiler and finally finished some very early alpha of this little dictionary program. In order to make it usable, I also added an extra Text Input module to handle kanas (text input is very nicely handled by Podzilla‘s API). 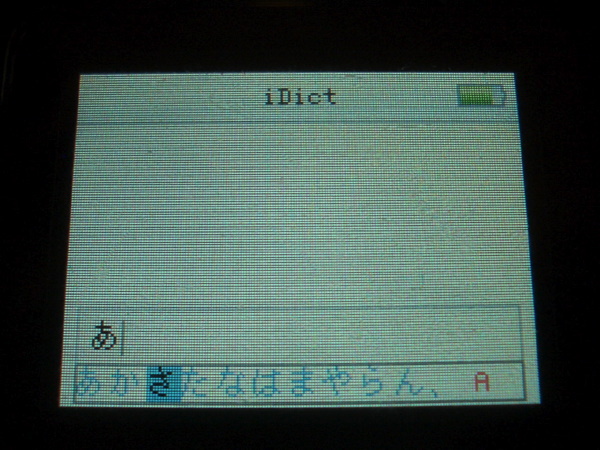 Inputting speed is currently similar to a phone, and I’m planning to improve it eventually, with predictive kanji input. In the meantime, I no longer have to carry an annoyingly incomplete pocket paper dictionary, to help me with my daily reading in the subway. Now, imagine an iPod with Bluetooth that you can use with a small wireless keyboard (possibly using speech synthesis and earphones to get feedback on what you type without having to stare at the screen), and you got one of the cheapest, most badass PDA out there. PS: If you are interested in test-driving this alpha, contact me in private and I’ll send you the files: but please do realize that you need to install iPodLinux on your iPod first, which is no walk in the park. Do not under any circumstances contact me for assistance on setting up Linux on your iPod: read the detailed instructions on their site. Having an RSS feed of entries with inline images and then hacking your website so that requests for images that aren’t referred from your website get a generic “don’t do that” image is inconsistent. – on one hand, many people pull this feed in their local client and enjoy being able to see pictures directly in it. – on the other hand, there are a handful online aggregators: bloglines, and apparently now, LiveJournal, for which this causes problem. At any rate, I feel it’s time to update this anti-hotlinking pic to something more neutral… I will also put together a pic-free alternative feed and see if I can think of any better way to deal with this. 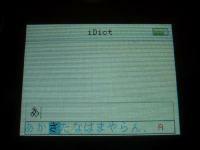 Looks like the second screenshot shows an application named “iDiot”. Weird. I can see how you don’t want the direct image links from those who don’t read your blog, and how you can’t tell an RSS aggregator from a leech (“What’s the difference?” asks the peanut gallery…). Maybe you could offer a full-text RSS feed and a headline RSS feed that has no images and a short intro with a link to the full post? Personally I don’t mind following a link to read postings, since I’m mainly using an RSS aggregator so I don’t have to manually go check dozens of separate URLs for stories, not because I’m allergic to following links myself. If you had a headline and full-text feed, I’d just go with the former in this case. hey I carry a palm tungsten for a $100 chinese dictionary http://www.plecodict.com/ a netmd player b/c listening to music kills my palm batteries so fast and a cheap nokia cell phone, I’ve been dreaming about a treo. does your dictionary do chinese too? what compiler did you use? I’m trying to add programs to podzilla or modules to podzilla2, but I have yet to get my hands on a working compiler. I found this site looking for a portable Chinese dictionary, and I love the idea. I don’t want to switch the operating system on my iPod, since I’ve got one of the unsupported new ones and I hear it greatly reduces the battery life. So instead, I formatted CEDICT so it is sorted into files by pinyin, so I have a somewhat usable Chinese-English dictionary (I’ve put this on http://lhtiv.com). Sadly, there is no input support as of yet. I’m now working on an English-to-Chinese version, but it is much harder to parse CEDICT in that direction. Hajimemashite, Davaa to moushimasu. Nihonjinjyaarimasenga, Nihongo wo benkyositeimasu. Davesamo benkyoshiteirundesyouka? Soretomo Nihonjindesuka? Davesan Sono jishyono sofuto wo okutte itadakenaydesyouka. Yoroshiku onegaishimasu. hey, can you send me the app too? 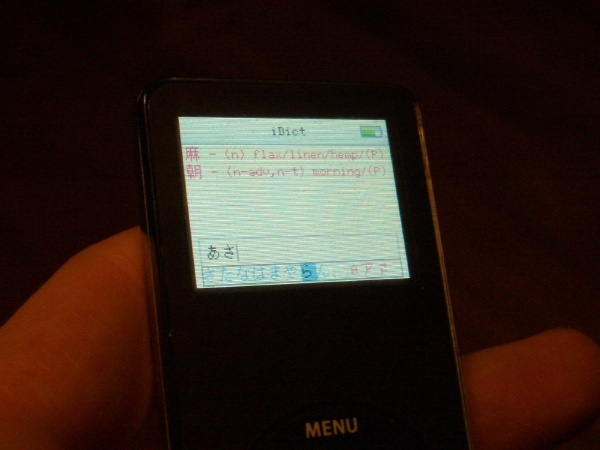 I have an Ipod Nano and would want to get more out of it too by including a jap dictionary. Thanks! 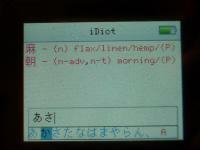 i really the english to chinese dictionary for my ipod nano. please help! does it work well?